Oven-baked, easy and delicious. 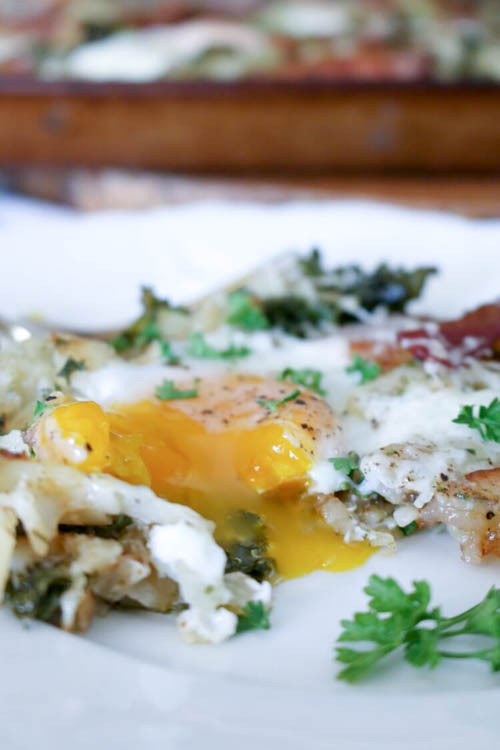 Baked kale is turned into nutritious crispy chips while hash browns and eggs add comfort to this simple breakfast. 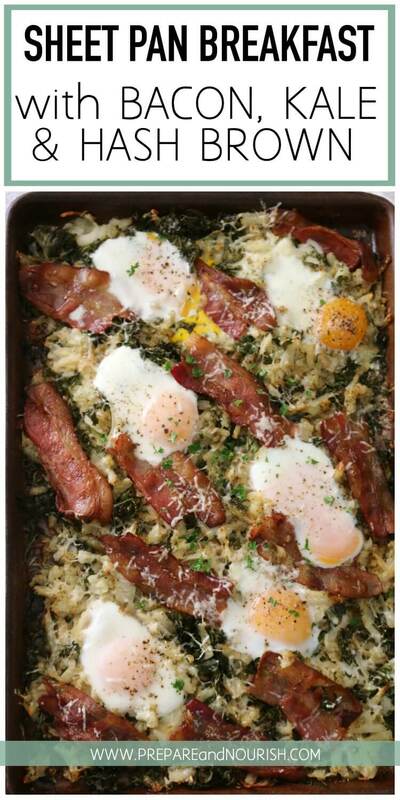 This Sheet Pan Breakfast with Kale, Bacon and Hash Browns makes a great meal for large company. Omit cheese for Whole30 and it’s just as good. Is it just me or is there a legitimate reason to avoid using the stove? I opt for the oven whenever I can to feed my family of hungry teenagers and hard-working hubby. I can no longer get away with making a hash brown breakfast on the skillet to feed everyone. Even when I use my large cast iron skillet. I would need two of those to sufficiently feed my brood. That’s why I’ve been loving all things sheet pan! 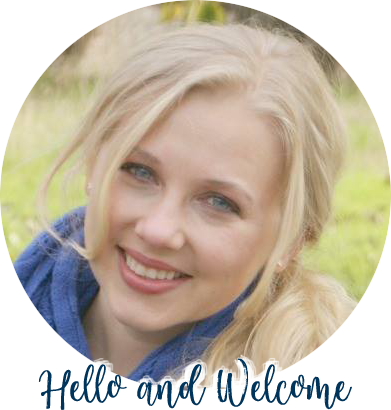 They are large enough for our family and I can even do two sheets at a time when we have company. And the best part? My stove is clean and since it’s literally in the middle of our kitchen with glorious morning light glaring right at it – that’s a good thing! 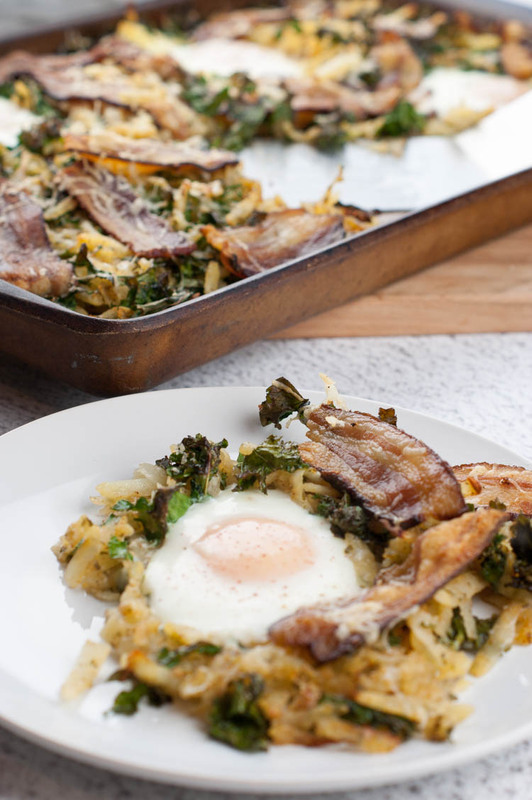 This Sheet Pan Kale and Bacon Hash Breakfast has all your favorite comfort-food ingredients but with an added bonus: kale. 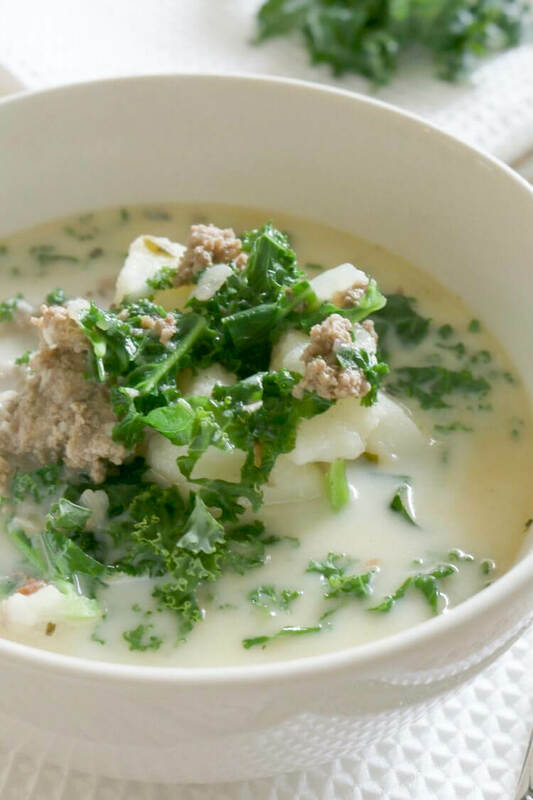 You can choose to opt out of this hardy green but if you’re wanting to add more vegetables to your diet – this is a great way. You can also swap kale with spinach or chopped chard, if kale is not your thing. The baking turns these nutritious greens into chips-like texture. It’s important to note that in order to achieve that crispy bacon, it has to be par-cooked first. Simply place it in a pre-heated oven for 15 minutes and while that’s cooking – prep your other ingredients. After this cooking time, I then remove the bacon and carefully pour out excess grease onto a half-pint mason jar to use for other recipes. Be sure to reserve a few tablespoons of the grease on the sheet pan for the hash brown and kale mixture. Note: Grease from bacon that is made with clean ingredients is good to use. I prefer to use antibiotic & hormone-free bacon cured with natural sugars. This bacon grease can be used for stir-frys, eggs and other recipes. My favorite method is cooking potatoes in the pressure cooker for 5 minutes on manual with natural release pressure. Do this the night before so the potatoes are completely cool to make shredding easier. I have not tried this with store-bought hash browns as they typically contain canola oil and/or preservatives and do not recommend them. If you do use frozen hash browns, I would suggest thaw them first and drain excess liquid. Finally, timer is your friend here. 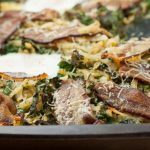 Because of the different cooking times of the ingredients used in this recipe, you will need to take the pan out a total of three times to add more ingredients for that perfect sheet pan breakfast. If you set a timer (I used my built-in oven timer), you should be okay. Having said that, ovens do vary so these times are just a general guideline. 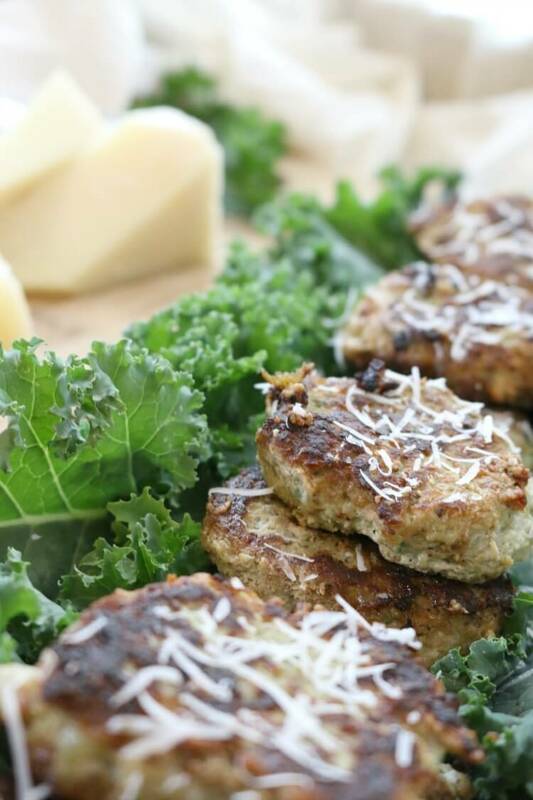 All your favorite comfort food ingredients with added nutrition from kale made easily on a sheet pan in the oven. If using frozen pre-made hash browns, thaw first and drain excess liquid. Or cook them the night before so it has enough time to cool down, making shredding easier. I cook them in my pressure cooker for 5 minutes with 5 minutes natural pressure release, then quick release. Cut bacon strips in half (this makes cooking quicker and easier to assemble later). Place them in single layer on a large sheet pan. Par-cook bacon for 15 minutes in a preheated oven on top rack. Set timer for 15 minutes. While bacon is cooking, combine hash brown, 3/4 cup cheese, salt, paprika, and parsley, and garlic powder together in a large bowl. Toss in kale and combine but don't over mix. When timer goes off after 15 minutes, remove sheet pan from the oven. Using tongs, remove bacon from sheet pan onto a plate. Carefully pour out excess bacon grease from the pan onto a small jar for other uses, reserving 2-3 tablespoons on the pan for the hash browns. Toss in the combined hash browns and kale mixture and spread evenly across the pan. 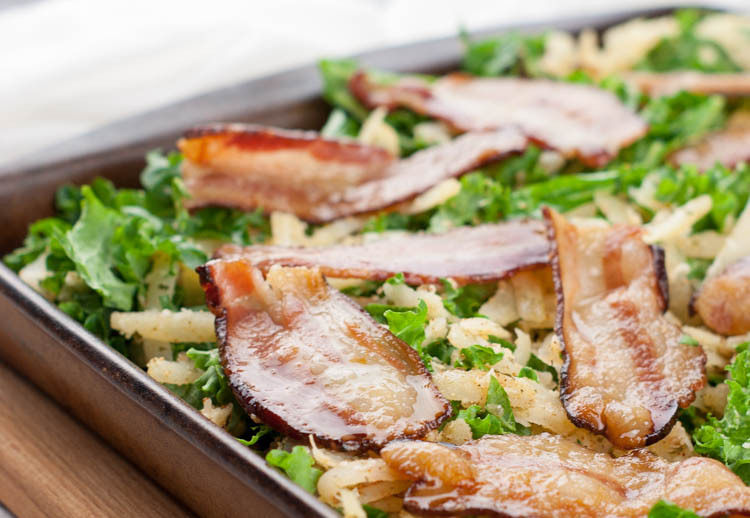 Set bacon strips directly on top of the hash brown and kale mixture and place back in the oven for 8 minutes on top rack. After the hash brown has cooked, remove the pan from the oven. Carefully make 4-6 small wells in the pan. Make sure the bottom of the wells are greased (they should be from the bacon). Break in the eggs into the wells. Season the eggs only with freshly ground salt and pepper. Toss the remaining 1/4 cup of parmesan cheese all throughout the pan. Set back in the oven on bottom rack for 5-7 minutes for softer yolks or longer for more well-done eggs, depending on preference. Yum yum yum!! Want this every Saturday and Sunday! Sheet pan breakfast! What a brilliant idea! 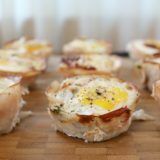 This sheet pan breakfast is a brilliant idea! My husband and Tiny Love would go crazy for this! I’m going to have to try it soon. 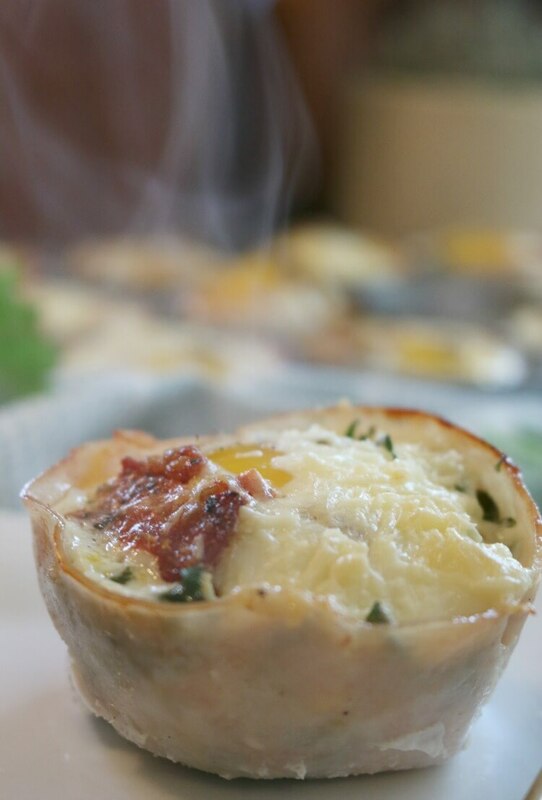 This looks like the perfect breakfast to feed a hungry family, I love anything that you can throw together and pop in the oven. I always have loads of kale in my garden , so love adding it to meals. I agree. I’ll employ my oven any time to make mornings a bit easier.